The disease originally named as Coniothyrium canker was observed in Italy for the first time in late summer 2015. The outbreak involved several trees of a hybrid clone of E. camaldulensis × E. viminalis, and few E. camaldulensis trees, while the parental species E. viminalis as well as other eucalypts species, including E. grandis, did not show any symptoms. The pathogen was identified as Teratosphaeria gauchensis on the basis of morphological and molecular evidences, and Koch’s postulates were fulfilled. Bayesian phylogenetic analysis of the sole T. gauchensis strains based on four concatenated genes (ITS, β-Tub, TEF-1α, and ATP6) grouped all the Italian isolates together with those from Hawaii, Ethiopia in one paraphyletic group, which included a South-American subclade. A further Bayesian analysis based on two genes (ITS and TEF-1α) which included 81 sequences of closely related species besides T. gauchensis namely, T. stellenboschiana and T. zuluensis, showed a certain level of variability within T. gauchensis clade in which T. stellenboschiana was nested. South-American strains confirmed to be high variable in both analysis. 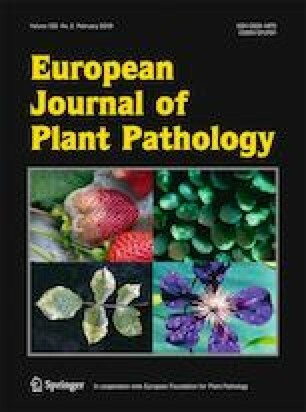 The outbreak of Teratosphaeria stem canker in Italy appears to be as a result of a recent introduction, from several independent introductions. This is consistent with the fact that the Italian isolates do not form a single monophyletic group but are interspersed by other geographical isolates. We are grateful to Francesco Menta, and Alvaro Pedemonti for their support in the fieldworks. We declare herein that our paper is original and unpublished elsewhere, and that this manuscript complies to the Ethical Rules applicable for this journal. Dr. Alessandra Belisario, on behalf of all the authors in the paper.